Despite the power of its panzer divisions, Germany still didn’t have the desired number of tanks at the start of WWII. To boost numbers, Germany adopted the Czech LT vz 38 tank after it had conquered Czechoslovakia. Production of this light tank continued until 1942, by which point some 1,400 vehicles had been manufactured. Indeed, the Czech design was superior to the Panzer I and II types that were so common at the beginning of the war. In German service it was known as the Pz.Kpfw.38(t), and it proved a very reliable design. This tank featured a 37mm Skoda A7 main gun in a two-man turret. One variant of the Pz.Kpfw.38(t) was the Ausf.S, with the ‘S’ in the nomenclature representing Sweden. This neutral country had ordered 90 tanks in February 1940, but they were subsequently seized by Germany for its own use. The Ausf.S tanks were fitted with extra radios and could thus be used as command tanks. Some were in fact exported to the Slovak Free State. 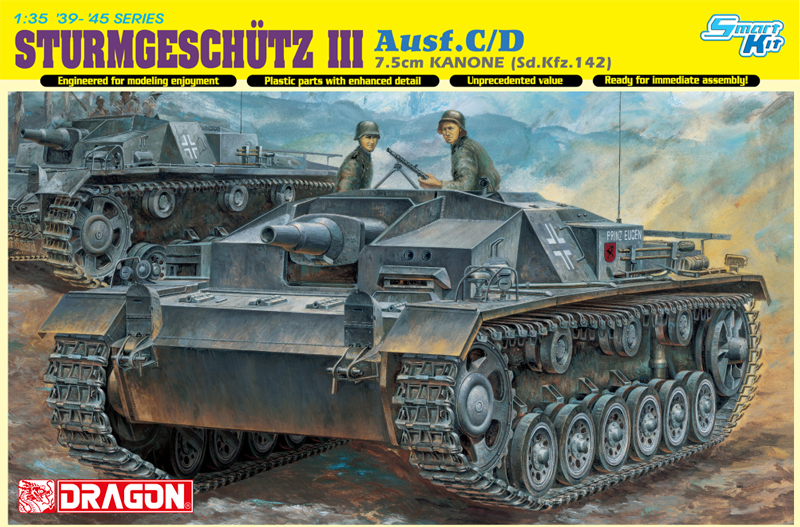 Dragon has issued a stunning new 1/35 scale plastic kit of the Pz.Kpfw.38(t) Ausf.S. 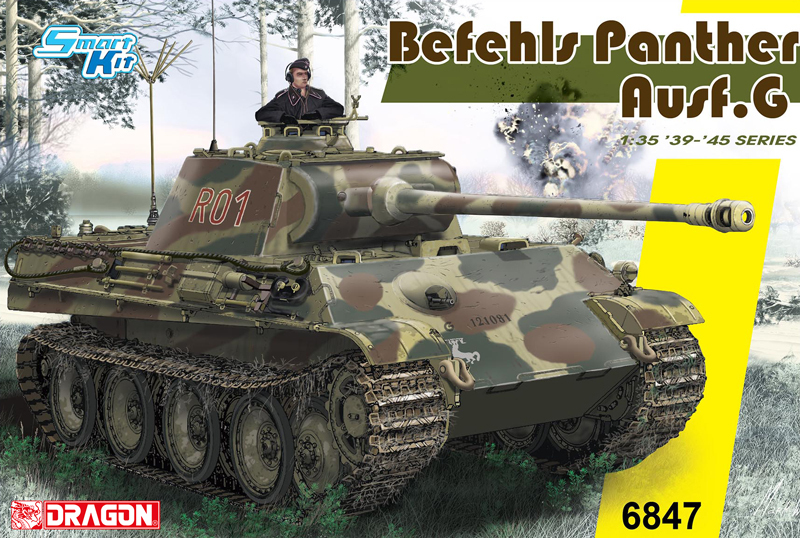 The tank features brand new turret frontal armor, and furthermore the model has innumerable interior parts to allow modelers to show off the innards of their tank through open hatches. 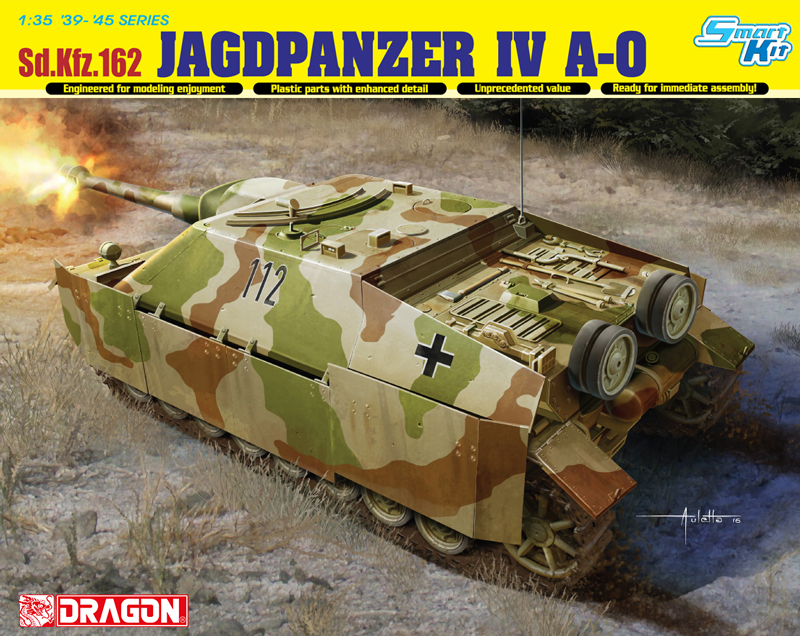 Or for the bold model-maker, the kit even allows a heavily battle-damaged tank to be depicted thanks to the superior level of interior detail. The kit’s further distinguished by coming with a complete single-axle trailer carrying a 200-liter fuel drum. This trailer is newly tooled, and it gives the tank a much-improved range of operation. The tank, towing its associated fuel trailer, will make for an extremely interesting early-war scene. Sweden contracted with Praga for 90 TNHPS tanks as well as a production license to build the machine in Sweden. But the Germans took over the tanks and used them instead, dubbing them the Pzkw. 38(t) Ausf. S (for Sweden). Closer to the Ausf. A/B/C than the E/F in production for Germany at the time, it was little different externally than the later machines. But in order to cover the expanse of western Russia, many of the tanks towed a 200 liter fuel drum during the early days of the campaign into the USSR. 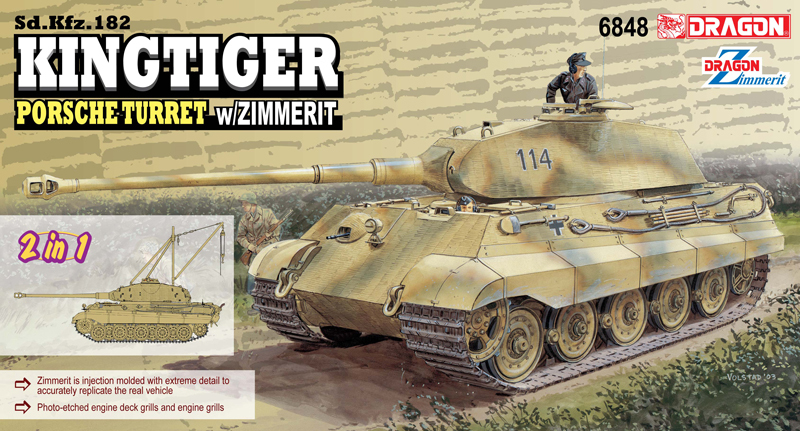 DML has combined their E/F/G kits with some new bits and the fuel trailer from the Tauchpanzer IV kit to create a replica of the early Russian campaign tanks. The kit provides the correct drive wheels with the excellent suspension as well as different springs for the bogie assemblies. Assembly follows earlier kitS and is pretty straightforward. However, the back plate (part B40) remains a single piece without a removable access hatch so the access cover cannot be shown open or removed as in performing maintenance on the engine. Only one set of engine access hatches is now provided for the engine deck. DML was "dinged" on earlier kits for the fenders. I personally think the tanks were built with straight fenders but once in service, whether it is crew use or track slap or something else, the front of the fenders from the center of the vehicle onward appear to take on a slight bend upward from the rear section. DML claims that the fenders now look the part but for the life of me I can't see it. Tracks are still "Magic Track" links, which are identical so do not have to be "handed" as with other kits. But they are tiny and tedious to assemble – perhaps DML will eventually offer DS tracks for these kits as well. The interior is pretty much complete as near as can be seen, but the warning needs to be given that due to the small hatches (commander's and radio operator’s) it will be very difficult to see the details even with an “IPMS Death Ray” (penlight). As noted the engine compartment is much more accessible as the hatches may be opened up on the deck cover. As this kit has fewer options DML’s directions are not as problematic with this kit as in past versions. Technical assistance is credited to Tom Cockle and Gary Edmundson. The kit offers four different finishing options backed up with a set of Cartograf decals. The options are: Unidentified Unit, Eastern Front, 1942 (grey, yellow 9); Unidentified Unit, Eastern Front 1942 (grey, white crosses only); 7th Panzer Division, Russia 1941 (grey, white 535); and Unidentified Unit, Bohemia 1945 (sand with green and brown dots, black crosses). Overall this is a nicely done kit but I am sure that once more there will be carping once more over the fenders. Despite the power of its panzer divisions, Germany still didn't have the desired number of tanks at the start of WWII. To boost numbers, Germany adopted the Czech LT vz 38 tank after it had conquered Czechoslovakia. Production of this light tank continued until 1942, by which point some 1,400 vehicles had been manufactured. Indeed, the Czech design was superior to the Panzer I and II types that were so common at the beginning of the war. In German service it was known as the Pz.Kpfw.38(t), and it proved a very reliable design. This tank featured a 37mm Skoda A7 main gun in a two-man turret. One variant of the Pz.Kpfw.38(t) was the Ausf.S, with the 'S' in the nomenclature representing Sweden. This neutral country had ordered 90 tanks in February 1940, but they were subsequently seized by Germany for its own use. The Ausf.S tanks were fitted with extra radios and could thus be used as command tanks. Some were in fact exported to the Slovak Free State. Supplied in a standard Dragon box, and quite a full box given the size of the completed model. Given the lineage of the kit, there's not a lot marked as 'not for use' on the included parts map either. 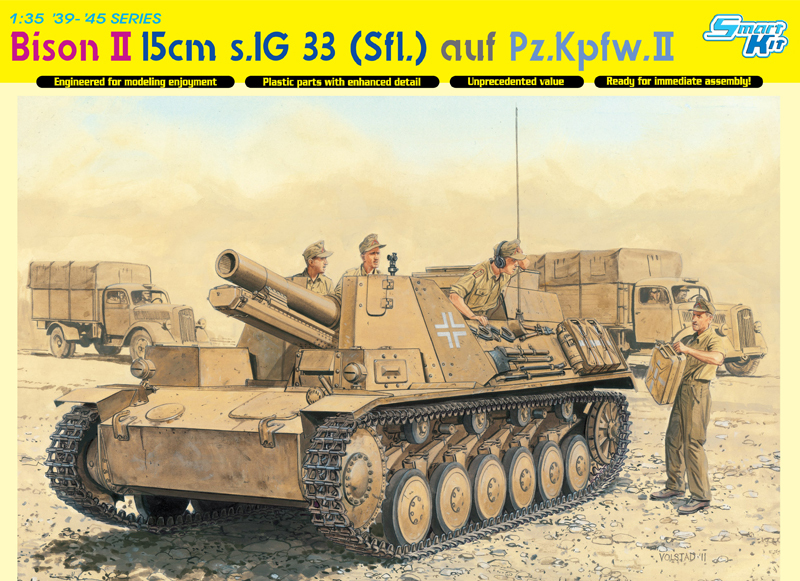 The kit consists sprues to make the Pz.Kpfw.38(t) itself and the small fuel trailer it tows behind. Aside from the collection of grey sprues, we're also given a small transparent sprue, two photo-etched brass frets, decal sheet, two wire tow cables, and a short length of black nylon cord. The lower hull of the vehicle is supplied as a slide-moulded shell onto which everything else is assembled. I do mean almost everything in the case of this one too. First off - the running gear. Idler wheels in two halves, the instructions indication the correct ones to use, i.e. those with the keyhole shaped lightning holes, rather than those with the round holes which are also supplied in the kit. The drive sprocket too is supplied in two halves and also has alternative supplied in the kit, i.e. with or without lightning holes in the outer portion of the sprocket. The box art shows the ones with the holes having been used. The four road wheels on either side consist of two paired bogies, the suspensions of which is leafsprung. At this point we're also directed to fit the patterned fighting compartment floor into place inside the hull. It would be wise not to cement this in place until later in the build since it's fairly easy to mis-locate this slightly, which can then lead to problems locating everything else inside the vehicle as the build progresses. Construction of the hull rear wall then takes place, and careful study of the instructions is needed here, since there are a few details that need to be removed, and also a few locating holes that need to be drilled through the part. There are also a few options provided in this area, and since there is no preferences indicated on the instructions then it's down to your own references which you should fit. In the absence of being able to find these, I usually go with the first on listed! The options include parts that consist of covers over the idler wheel adjustments, or no covers, and a tow hook with or without locking bar. Each of the fenders in the kit are supplied as one-piece, with obviously separate fender supports, and then it's time to fit the tracks, which are supplied as individual 'Magic Track' ones. There's one bag of them, there being no right or left-handed links, and each is superbly moulded with even a tiny casting number on each one, and two tiny ejector pin marks on their inside face. These are actually almost unnoticeable, but they are there, and I know many people (including me) won't mind spending an hour or two cleaning them off for the perfect finish! Construction then moves to the inside of the vehicle. With most closed fighting compartment vehicles, this usually consists of sticking the machine gun through the front of the hull. Not so with this one! There's almost a full inside provided, including transmission, driver's are, levers, seats etc., engine firewall, engine etc. No area has been left empty...it's almost a shame to close this one up! Lot's of fun painting it though! The large engine access hatches are supplied as separate parts and so can be displayed opened, although they have no detail other than a couple of ejector pin marks on their inner surfaces. There are also two types provided, and catered for as a small errata sheet to the instructions. The type originally supplied with the kit has a smooth surface, whilst the alternative ones have a double row of rivets along their lower edge. Each of these are fitted with a long strip of photo-etched mesh under their edge to represent the vent mesh. At the rear of the engine deck the large ventilator mesh and housing is also supplied as photo-etch over an injection moulded grid, and there's also a photo-etched slat provided. Moving then to the front of the fighting compartment, there's a complete machine gun provided for the co-driver, with even a belt of ammunition...I'd be interested to hear from anybody that had found a successful way to bend one of these without breaking it into bits! All the various on-vehicle tools are supplied with or without moulded on clamps, as a full set of photo-etched alternatives are supplied, along with a photo-etched toolbox for the right fender. Moving onto the turret, the 3.7mm KwK L/45 is supplied with a slide-moulded barrel with therefore a pre-drilled end. The breech is supplied in two halves and looks a little simplified, although it's adequate to be seen through an open hatch. There's another machine gun and stiff looking belt of ammunition, and the commander's cupola is provided as a multi-part assembly with clear parts to represent the four periscopes around its circumference, with the hatch itself of course being a separate part. The turret is also supplied with a full set of ammunitions cases in addition to the ones stored inside the fighting compartment, and so looks fairly busy, with crew seats, traverse mechanism etc. The trailer supplied with the kit is similar to the one shown completed below, although this one only holds one fuel drum. Aside from that the slightly smaller frame it sits on, the parts are the same. Each of the two mudguards are supplied moulded either side of the frame that the fuel drum sits on, onto which a simplified axle is fitted, two suspension sprigs and the wheels, plus tow bar assembly. There are two drums supplied in the kit, both slide-moulded so there aren't two halves to join, and therefore no ugly join to disguise. Each is supplied with two nicely detailed end-pieces embossed with relevant information. The black nylon cord supplied is supposed to be used as the hose leading to the engine compartment of the tank...you'd be wise to keep it for something else, I found it almost unusable due to not being able to affix it to the fuel drum without it fraying all the time. In the picture below I've used thick lead wire. Instructions are also included for stowing the fuel hose on the tank itself. There are four paint schemes illustrated on the instructions, three of which are grey and on the Eastern Front, two of which are of unidentified units and the fourth in a two colour camouflage scheme over dark yellow basecoat. See below for full details. 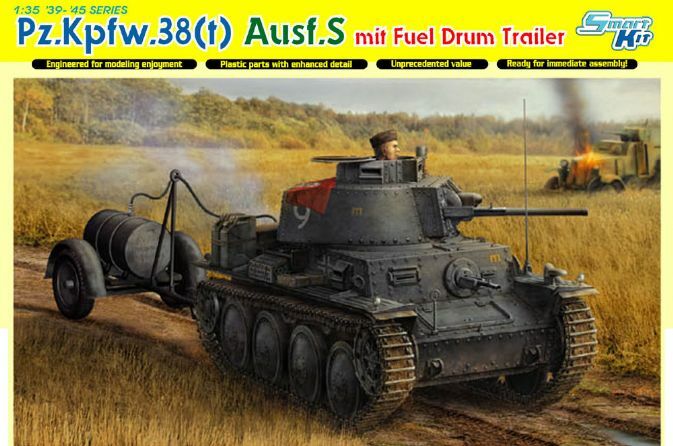 6435, Pz.Kpfw.38(t) Ausf.S mit Fuel Drum Trailer Smart Kit. 1/35th-scale styrene/multimedia kit containing 428 styrene parts (including 10 clear), one bag of Magic Tracks, two etched brass frets, one piece of braided metal wire, one piece of braided string, four water-slide decal markings schemes and 10 pages of instructions in 27 steps, plus addendum. DML has already issued a number of Smart Kits based on the Pz.Kpfw.38(t) chassis, to include (most recently) a 2-in-1 kit of the Ausf.E/F gun tank to stand beside their kit of the Ausf.G. 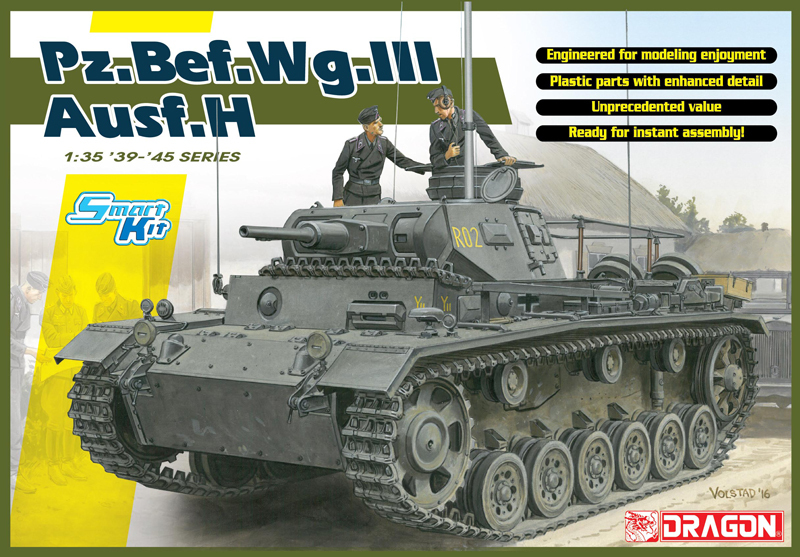 They have now issued a kit with new parts that will allow the modeler to construct an Ausf.S. The main bits are a new superstructure front plate, a new hull bow plate and a new turret. As a bonus, an auxiliary fuel trailer carrying a single 200-liter fuel drum is included. 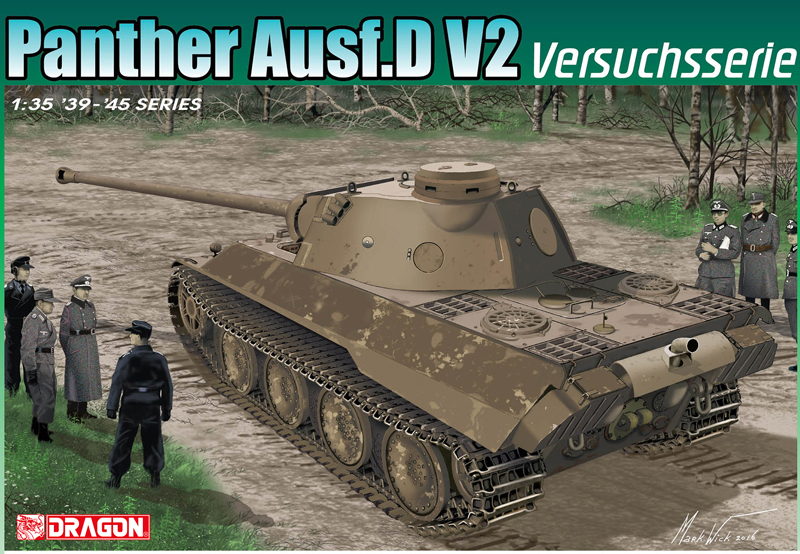 It is based in part on a twin-drum trailer that was originally included in DMLs Pz.Kpfw.IV Ausf.E Tauchpanzer kit. In fact, either trailer can be built with the parts provided, although (apparently) only the single-drum trailer is appropriate for the Pz.Kpfw.38(t). 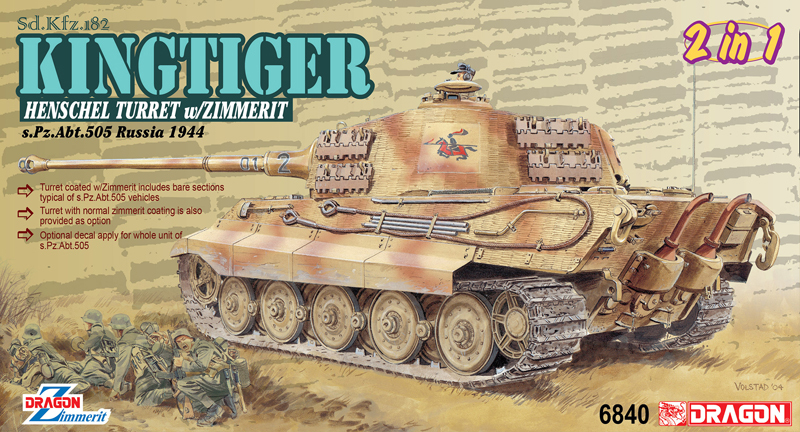 New water-slide decals are provided, which give accurate markings for the Ausf.S. However, at least two of these schemes belonged to Ausf.Ss that had unit-specific stowage lockers fitted to their track-guards. 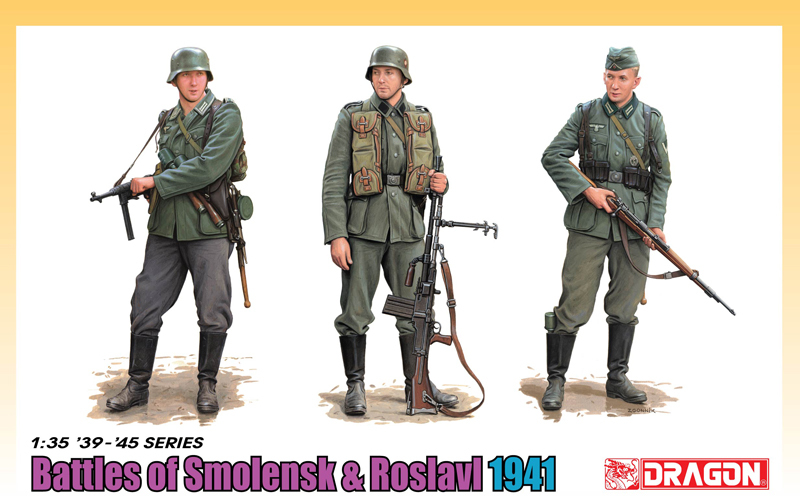 Unfortunately, these lockers are not included in the box, but they are in the Ausf.E/F kit, number 6434. These are the usual Magic Tracks and therefore come as individual links packed loosely in a bag. Each link has an extremely tiny pour pip between the guide horns as well as two very subtle ejector pin marks on the inner face. The fit is very good, but they will not stay together unless they are glued. The guide horns are properly hollow, and the links have a very delicate cast texture. Furthermore, they all have extremely faint casting numbers where appropriate. Each has a faint ejector pin mark on the inner face, which, for the most part, will not be visible on the finished model. The suspension system is broken down much like most renditions from other manufacturers; this means that the road-wheels can be depicted in an articulated fashion to conform to terrain on a modelers display base. Planning will be needed since getting the bogies properly positioned and then getting the tracks to look right will be a bit of a challenge. The road-wheels are completely and properly detailed on both their inner and outer faces, while the return rollers have separate mounts and include manufacturers name on the rubber tire rims. There are two styles of leaf spring bundles, while the return roller mounts are separate parts. Two types of idler wheel can be mounted in various positions due to a separate cranked axle; this will ease using individual link tracks and therefore it should not be fixed in place until the modeler is satisfied with the fit of the tracks. The drive sprockets feature perforations around their rims, and are very nicely-detailed to include the ribs and bolt patterns seen between their inner and outer halves. A second set with smooth rims are provided, but they are not for use in this instance. The hull is the usual slide-molded pan that includes the side walls molded in place together with the belly plate. There is proper rivet and panel details on the three outer sides, as well as suspension mount details on the side walls. Whats unique here is that there is also molded-on detail on the inner faces of the side walls, in the drivers and fighting compartment. There is also molded-on detail on the inner surfaces around the area of the drive sprockets. All this makes for a more simplified assembly process with absolutely no compromise in the detail department. Separate inner and outer bow plates are provided, with the new outer plate featuring the proper rivet pattern seen on the Ausf.S. It depicts the 25mm plate fitted with an additional 25mm applique plate. The outer bow plate also receives separate tow hooks. A separate rear hull plate features a separate circular access panel. 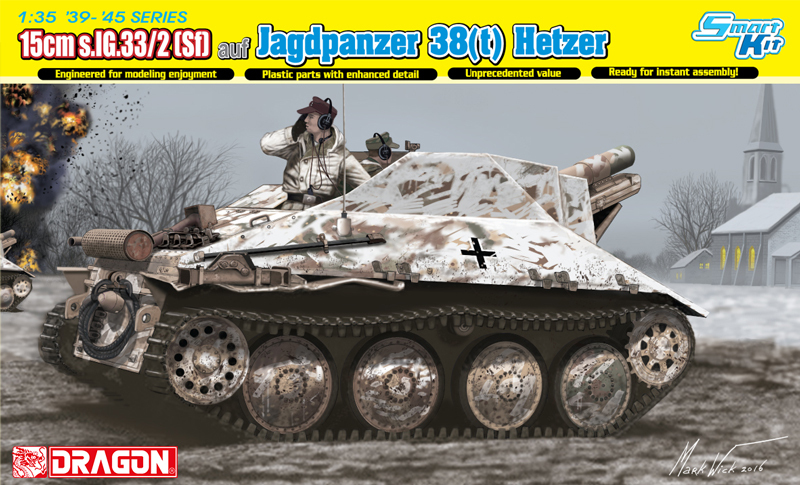 Options include idler wheel adjustment mechanisms or covers, two different exhaust pipe configurations (straight or raised), Nebelkerzenabwurfvorrichtung (rack to deploy smoke candles) with armored cover, and various tow hooks. Etched brass straps can hold a tow cable made from braided metal wire and styrene end-loops; the latter are slide-molded so the cable will fit neatly into place. Up forward, the glacis plate features a separate transmission access hatch lid, a styrene drivers rough sight, and a mounting post for a head-lamp. The new superstructure front plate for the Ausf.S also depicts the type with a 25mm basis fitted with an additional 25mm applique plate. This plate features detailed inner and outer faces, with one separate view-port lid with a clear styrene insert for vision block. The second visor, unique to the Ausf.S, is molded in place. A proper antenna mount, rubber base and rod antenna are given for the port side, while a horn is fixed to the opposite side. The 7.92mm MG37(t) is a multi-part assembly, which includes a slide-molded barrel and receiver group, with opened muzzle. Among its separate parts are a gun-sight, a length of belted ammunition, an external armored sleeve and the external ball mount cover. The separate fighting compartment roof plate incorporates the rear wall of the superstructure, and is provided with separate hatch lids; the latter feature well-done head-pad texture and are devoid of any detail-marring ejector pin marks. Various etched parts as well as a grab handle detail this area, while the turret ring, true to the prototype, does not have any bayonet mount cut-outs on its rim to be used to hold the turret in place. There is also a turret ring guard molded in place. The engine deck panel is a separate part that features separate access hatch lids and a separate grill. There are two sets of hatch lids. One set has a row of rivets along the bottom edges; the other does not. References indicate the set with the rivets on the bottom edge should be used. The access hatch lids feature separate end parts with rivet detail as well as etched brass frames and screens for their undersides. The engine hot air exhaust grill gets nicely done etched brass parts for the screens. Styrene bolt heads are included on the sprues; these are to be shaved off and applied to the frame around the etched brass screen section. The track-guards are separate and feature stamped rib details on the upper and lower faces; all mounting brackets are separate parts and there are a number of tiny wing nuts that can be added for enhanced detail. The port side is fitted with a Notek head-lamp and a shrouded rear-view mirror. Tools are all separate and also feature etched brass brackets and straps as do the various tail-lamp assemblies. The perforated grouser box is provided as a styrene or etched brass assembly; on this is stored the multi-part vehicle jack which, again, has etched brass mounting brackets. Various etched parts are provided to create the racks that hold spare track links, while a jack block is also included. Photographs indicate that several units modified the tool and OVM stowage, while others added large, custom-fitted stowage lockers on both sides, or various stowage lockers. These are not provided as options in this kit, which is a pity since at least two of the markings schemes provided require them. Curiously, DML has these parts in their system since they are, as mentioned above, included in the Ausf.E/F kit. Reference photos should also be consulted if a specific configuration is desired. This is based on a slide-molded main core and is new for this kit. The Ausf.S turret featured sides and rear walls that were 15mm thick; this is accurately depicted. To this is added a slide-molded commanders cupola that is further detailed with separate parts; it also has a beautifully-done hatch lid with textured head-pad. Note that what appears to be an ejector pin mark is no such thing; it is the inner detail for the small signal port flap. There is a choice of two styles of rotating periscope (one has a weather-proof boot; the other does not). The turret race and the lower rear plate are separate parts and there is also another separate part for just below the mantlet. Rivet and bolt patterns are present in all the proper places and the panel lines between each adjoining plate of armor are nicely restrained. The front plate accurately depicts the 25mm-thick panel with 25mm applique as seen on the Ausf.S; naturally, this part includes a proper rivet pattern. The mantlet is separate as is the slide-molded, pre-bored 3.7cm KwK; naturally, the gun can elevate after construction is complete, but be careful with the glue. Other parts for the co-axial MG mount are provided, to include its outer mounting collar. The MG37(t) itself is molded in a similar fashion to that fitted in the superstructure front plate. The hull/fighting compartment includes a very nice multi-part transmission based on a slide-molded core, with attached drivers hand controls. The revised etched brass parts are also included. While these add detail to the original styrene parts, the assembly still lacks several control rods; references should be checked for further details. A drive shaft and non-skid protective cover completes this assembly. There are multi-part drivers and radio operators seats, an instrument panel and the typical floor-mat seen in these tanks. A bulkhead/engine compartment firewall encloses the compartment from the rear. A spare MG37(t) gun barrel, ammunition boxes, as well as a number of other smaller detail parts are also provided. All vision ports have interior details and include clear styrene parts to represent the glass blocks. The multi-part radio assembly includes transformer and junction box and is now mounted on the port-side inner side wall. In step 15, the instructions show the radios assembly sequence, but there are no specific directions on where it or any of the accessories are mounted. It is shown (partially obscured) mounted on the side wall in step 16. The engine compartment features fuel cells, battery box and various accessories, often enhanced with etched brass parts. A multi-part radiator and housing as well as fan are also given. The engine itself is broken down into many, many separate parts and comparing it to photographs reveals that it is visually very accurate. Just about all that is needed is for the modeler to add wiring and fuel lines for a complete appearance. The access hatch lids as well as the circular panel seen on the hull rear plate can all be left open to reveal the detail. The turret interior features ammunition stowage lockers, accessory bins, traverse hand-wheel and rotating periscope detail. The main gun itself features sights and breech detail, but be advised that the Germans removed the perforated breech guard prior to use. There is also a pair of bicycle-type seats for the turret crew as well as clear vision blocks for the interior of the commanders cupola. Of course, as with any kit that has interior details, much can be added by the modeler, especially such items as crewmens gear. Lots of other items are not given, such as the internal fire extinguisher, drivers foot pedals and hand-break, turret slip-ring and conduit, plus various small plates, boxes, and conduits. Inside the turret, there are no brow-pads for the commanders cupola, while it would appear that the main gun trigger group is also absent. Using the cited references, many of these missing bits can be added using styrene sheet and rod, and by raiding a well-stocked spares bin. Based on experience with other DML Pz.Kpfw.38(t) kits, I anticipate no problems with parts fit. 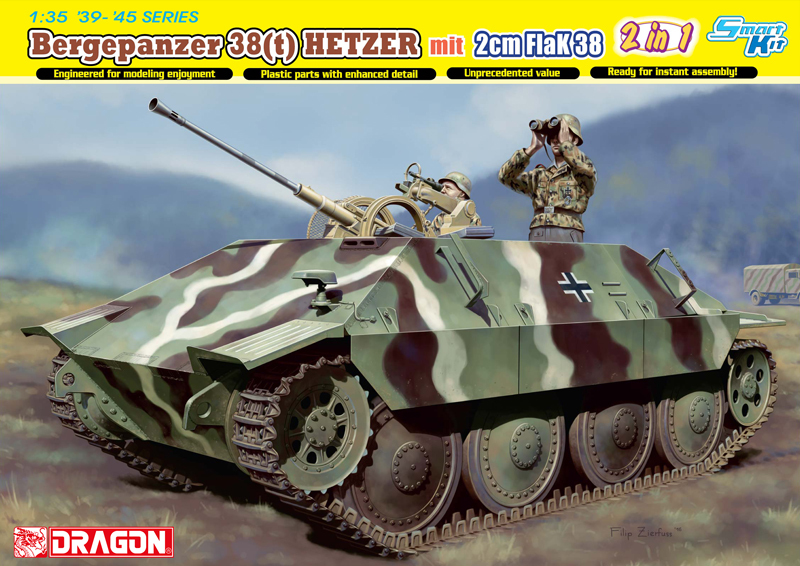 Of course since this kit is the basis for several others, there are many more separate parts than might be usual; the modeler is urged to clean them and check the fit as he proceeds. No sink marks were found and in every case except for the above-mentioned individual link tracks, there were no visible ejector pin marks. There are the typical small nodes on many parts, which require lots of effort to clean. However, this is better than the alternative: ejector pin marks that need filling and sanding, with the obliteration of surrounding details a distinct possibility. Molding is typically crisp and all part seams are restrained and easily cleaned. According to drawings in reference 2, cited below, this kit is dimensionally very accurate. Placement of details is also substantially correct. DML has done a fine job, especially depicting some of the different rivet- and bolt-head styles and patterns. I am still not sure about the position and the configuration of the radio set; references are not conclusive on this point. I suppose the biggest issue involves the many missing bits in the interior as well as the disconnect between the markings and unit-specific stowage lockers. These are in the typical, and busy, line drawing style. There are many sub-steps within the main steps, but with patience and due diligence on the part of the modeler, all will be well in the end. The small addendum sheet covers the alternate engine deck access hatch lids. Yellow 9, 20.Panzer-Division, Ostfront 1941 (given as unidentified unit). White 535, 5.Kp./Panzer-Regimant 27, 19.Panzer-Division, Ostfront 1941-1942 (erroneously given as being from 7.Panzer-Division). Three of these tanks are to be finished in Dunkelgrau, while one is covered in Dunkelgelb with a mottled Rotbraun and Dunkelgruen camouflage pattern. References indicate the markings and color schemes are accurate. However, the modeler is cautioned to check his own sources to determine which markings would be seen with a particular stowage arrangement. From the point-of-view of a typical fan of the Pz.Kpfw.38(t)-series, it is nice to see the Ausf.S kitted, despite my criticism based on some omissions. The kit is basically quite accurate, well-molded, easily assembled and nicely detailed. Now, if only DML would kit a Pz.Kpfw.38(t) Ausf.A, B, C or D, with the stepped superstructure front plate, the family would be complete.